But now we must celebrate and rejoice, because your brother was dead and has come to life again; he was lost and has been found. '” -Luke 15:1-3.11-32. The Forty Martyrs were soldiers quartered at Sebaste in Armenia, about the year 320. When their legion was ordered to offer sacrifice to idols, they refused to betray the faith of their baptism, and replied to all persuasive efforts, We are Christians! When neither cajolings or threats could change them, after several days of imprisonment they were chained together and taken to the site of execution. It was a cruel winter, and they were condemned to lie without clothing on the icy surface of a pond in the open air until they froze to death. The forty, not merely undismayed but filled with joy at the prospect of suffering for Jesus Christ, said: No doubt it is difficult to support so acute a cold, but it will be agreeable to go to paradise by this route; the torment is of short duration, and the glory will be eternal. This cruel night will win for us an eternity of delights. Lord, forty of us are entering combat; grant that we may be forty to receive the crown! There were warm baths close by, ready for any among them who would deny Christ. One of the confessors lost heart, renounced his faith, and went to cast himself into the basin of warm water prepared for that intention. But the sudden change in temperature suffocated him and he expired, losing at once both temporal and eternal life. The still living martyrs were fortified in their resolution, beholding this scene. 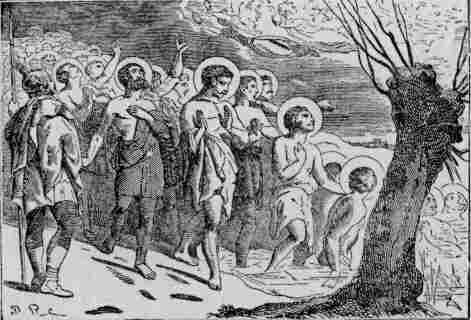 Then the ice was suddenly flooded with a bright light; one of the soldiers guarding the men, nearly blinded by the light, raised his eyes and saw Angels descend with forty crowns which they held in the air over the martyrs’ heads; but the fortieth one remained without a destination. The sentry was inspired to confess Christ, saying: That crown will be for me! Abandoning his coat and clothing, he went to replace the unfortunate apostate on the ice, crying out: I am a Christian! And the number of forty was again complete. They remained steadfast while their limbs grew stiff and frozen, and died one by one. Among the forty there was a young soldier named Meliton who held out longest against the cold, and when the officers came to cart away the dead bodies they found him still breathing. 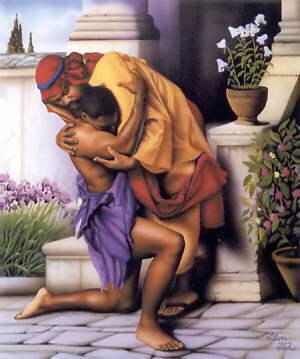 They were moved with pity, and wanted to leave him alive, hoping he would still change his mind. But his mother stood by, and this valiant woman could not bear to see her son separated from the band of martyrs. She exhorted him to persevere, and lifted his frozen body into the cart. He was just able to make a sign of recognition, and was borne away, to be thrown into the flames with the dead bodies of his brethren. Their bones were cast into the river, but they floated and were gathered up by the faithful.